The Pacific Northwest Historical Documents database is a collection of original, diaries, letters, reminiscences and political documents drawn from various sources within the Special Collections Division. These documents recount the early settlement of Washington and the establishment of homesteads and towns and describe the hardships faced by many of the early pioneers. 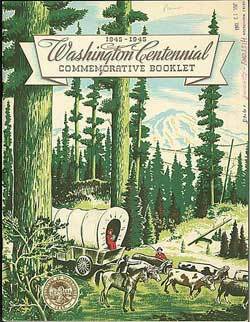 Some writings also focus on political and societal issues that challenged the settlers of the Pacific Northwest, such as, the women's suffrage movement. A number of the handwritten documents have been transcribed, as well as scanned at a higher resolution to enable the user to view them in more detail. In some cases, only selections from each collection or item were digitized. Many, however, were scanned in their entirety. Some material was scanned in grayscale using a Microtek Scanmaker 9600L and saved in .jpg format. Other letters and ephemera in this collection were scanned using a Microtek ScanMaker 9600XL saved as TIFF files, manipulated in Adobe PhotoShop to achieve the best and clearest possible digital image and loaded into the Contentdm JPEG 2000 software. The scanned images were then linked with descriptive data using Contentdm software. The material for this database was selected, researched and described by Kristin Kinsey, Sarah Weeks, Sheri Boggs, Sarmila C. Franklin, Cortney Leach , James W. Rosenzweig, and Jade D'Addario. Explore the database by looking through these Manuscripts, Publications and Books.